The Phil and Teds Navigator Buggy has been discontinued. With its Navigator Buggy, Phil and Teds has put forth a lot of effort designing their stroller which is suitable for one or two children. The included seat lies down flat, so it can accommodate a newborn. In addition, the snug carrycot (bassinet) for newborns and face-to-face rear facing (parent-facing) seat can also be purchased separately as accessories. However, unlike the Britax B-Ready, you can not fit two infant car seats at the same time. And, unlike the Baby Jogger City Select, you can not fit a bassinet with a regular seat or infant car seat. In any case, we feel like there are almost too many options and extra accessories with this stroller. Which will create extra hassle when needing adjustments and of course, the need for extra space when storing. The Phil and Teds Navigator Buggy is a fully functioning, hip-looking stroller with eye-popping fabric color combinations, pneumatic wheels, follow-the-sun canopy, easy one-hand fold, ergonomic and ventilated seating, and capability for use as an inline double stroller. However, with limited storage space, it may not fit the bill for those who routinely use the stroller for shopping with baby. Overall, the Navigator Buggy is not an easy stroller to use, scoring a 5 of 10 in our testing. For as sleek and interesting as it may look, it's actually very heavy and awkward to fold and unfold, load and unload, and adjust. This stroller folds and unfolds fairly easily in 3 steps, but it is a beast to lift at 30 lbs 5 oz. Also, the folding lock doesn't reliably self-engage without help. Because it has a bulky fold, the wheels can be removed without tools for a more compact shape. If used as a double, in-line stroller, the second seat needs to be removed before folding can take place. Unfolding also takes 3 steps, and can be a little trickier to do if strength is an issue because of its significant weight and size. It is simply heavy and bulky. The seat is included with purchase. The seat backing is contoured for ergonomic comfort and back support and also ventilated to increase air flow, while the removable zippered seat liner made of 100% polyester is easy to clean. Designed with a four-position recline, the Navigator seat ranges from a completely flat to an upright position. The shoulder and crotch straps have adjustments to accommodate newborn to child, and the plastic footwell is easy-to-clean. There are also three additional single seating options which can be purchased separately as accessories: the face-to-face seat, infant car seat adaptor for infant car seat, and snug carrycot (bassinet). However, the included seat is able to lie back completely so it can hold a newborn. In addition, the trademark Inline™ design will allow you to add an extra seat for another baby or child. Although we did not test it, the double kit adds on to the rear or front to accommodate newborns through 5 year-olds, for a total of 8 different seating combinations. The height-adjustable sunshade is average-in-size, but adjusts forward in several positions to provide sun protection from all directions. There is also a "flick out" visor to shield baby's eyes. The adjustable handlebar has a comfy handle shape and a very wide range from 28.5" to 43.3" to suit varying heights well. Adjustable handlebar has a min-max height of 28.5"-43.3"
The storage basket is large, but narrow. There is a large opening at the back of the basket, but when the seat is fully reclined, it is more difficult to access. There are unique pockets on the side of the sunshade as well. The parent tray, child tray, and cup holder are only available as accessories. This stroller received a 7 of 10 in Maneuverability. It has a pretty compact footprint and does fairly well in tight places. We recommend using two hands for steering, however. Steering with one hand made us feel like the stroller wanted to tip over. In our experience, the Navigator tends to be a rough ride on uneven terrain. The stroller's suspension relies on its 11.5" pneumatic tires. The BOB Revolution SE and Baby Trend Expedition will give you much smoother rides. 11.5" pneumatic tires provide suspension, but uneven terrain can be a bit rough. Curbs and stairs are much easier to navigate when the handlebar is positioned tilted fully forward. 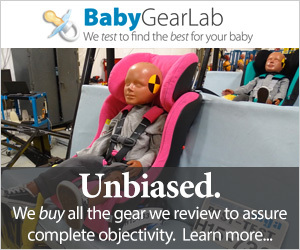 This stroller fared a 6 of 10 compared to the other strollers we tested in Safety. We found it to be below average in stability, being quite tippy sideways. It was the lowest scoring in our sideways tip over test, tipping with a 20 lb stunt baby in the seat with brakes set, on a 17.3 degree incline. It did perform well above average in our backwards tip over test, however, needing 33 lbs 4 oz of weight on the handlebar before tipping backwards. In our testing, there was a lot of play in the brakes when set. When the stroller is at rest, you can lock it into place with the easy-to-push foot brake, but releasing it is a tad more challenging. We struggled to get the straps on the padded 5-point harness tight enough for our liking. Nontheless, the Navigator has undergone several international safety tests, and is certified compliant with EN1888:2005, ASTM F833-10, AS/NZS 2088:2009-CPN8 AUS/NZ, and SOR Canada standards. This was one of the best strollers we tested in Quality/Durability with a score of 8 of 10. Overall, we felt the aluminum frame to be sturdy with tight connections and nice 100% Polyester wipe-clean, zip-off material. Phil and Teds has upgraded the fabric on the Navigator to "premium 450 denier" to provide a more attractive, matte-finished look as well as a softer feel to the touch. High-quality fabric has a soft matte finish and can be and wiped clean. This stroller was one of our lowest scoring in the Weight/Folded Size category, scoring a 3 of 10. It was the second heaviest stroller that we tested in this round-up of 21 strollers at 30 lbs 5 oz. Folded, it is large and awkward to handle. As mentioned, the wheels can be easily removed for a more compact storage shape. The manufacturer's specified capacities for this stroller are up to 44 pounds in the front seat and up to 33 pounds in the back seat. For us, the Navigator's set up time was 17:01 (min:sec) with an ease-of-set-up score of 3 of 10, compared to the 20 other strollers we tested in our review. We felt that the documentation was poor using only pictures without any accompanying text. Don't get us wrong, illustrations are good, but lack of text is a mistake, in our opinion. If you'd like the option of adding another seat to your stroller as well as something that will stand out in a crowd, then this stroller is a good choice. Before making a final purchasing decision, however, we recommend taking a look at three other expandable strollers we tested in this review: our Editors' Choice winner, the UPPAbaby Vista, the Baby Jogger City Select and the Britax B-Ready. This stroller is a pretty good buy, especially considering its ability to add-on a second-seat. Although it doesn't function with a bassinet or infant car seat and a second seat at the same time, the included seat does lie down flat for newborns. The Navigator's funky design and second-seat add-on capability make it a very cool stroller to walk down any street. The 3 pneumatic tires with the locking swivel front wheel allow for a smooth ride on paved terrain although we feel it tends to be tippy. On uneven terrain, the pneumatic tires don't provide enough suspension for as smooth of a ride as we'd like. Don't get us wrong, there are many things to like about this stroller, but in our opinion, there are better, lighter, expandable options for the same price in the Baby Jogger City Select and the Britax B-Ready. For $250 more, the UPPAbaby Vista will give you an included bassinet and many great features, including expandability. This stroller comes standard in the Golden Kiwi color with a sun canopy and removable seat liner. The canopy, seat liners, and carrycot hoods are available in three other mix-and-match colors besides the Golden Kiwi (Cherry, Black, and Sky), which are sold separately. Many color options for seat and sunshade. Seating accessories made especially for the Navigator that are sold separately include: the face-to-face parent-facing seat, the snug carrycot, the double seat kit, and a wide range of infant car seat adaptors for the Phil and Teds infant car seat as well as adaptors for Graco, Chicco, Peg Perego, Maxicosi, and Cybex brand infant car seats. Double seat kit in the back. Other accessories sold separately include: the cup holder, bottle holder, food tray, replacement wheel parts, a handle, bumper (belly) bar, replacement parcel tray, vinyl backflap, mesh backflap, and the freerider (combination wheelboard and scooter). Phil and Teds manufacture several other stroller models, including: the Classic, the Dot, the Verve, the Promenade, and the S4 Inline, as well as a couple of side-by-side double strollers, jogging strollers, and a compact umbrella stroller. Here is a long (almost 10 minutes), although comprehensive, instructional video for the Phil and Teds Navigator Buggy.